| Our Mission Is To Love & Serve, Unconditionally, Those In Need, Through Health Care, Education, & Spiritual Transformation. Our Mission Is To Love & Serve, Unconditionally, Those In Need, Through Health Care, Education, & Spiritual Transformation. We have good news for you. By the grace of God and your continued prayers, Alex is healthy and can travel to India to continue Samarpan’s medical mission. Mary and Alex will be leaving for India during the first week of November. This is their 27th medical mission trip to India. Though we started as a small medical clinic in a small village with Samarpan’s unconditional support and God’s provident love, the clinic grew into several humanitarian services such as: vision and dental care, children’s library, clean drinking water program, immunization program, youth soccer program and recently ”Meals on Heel’s”. 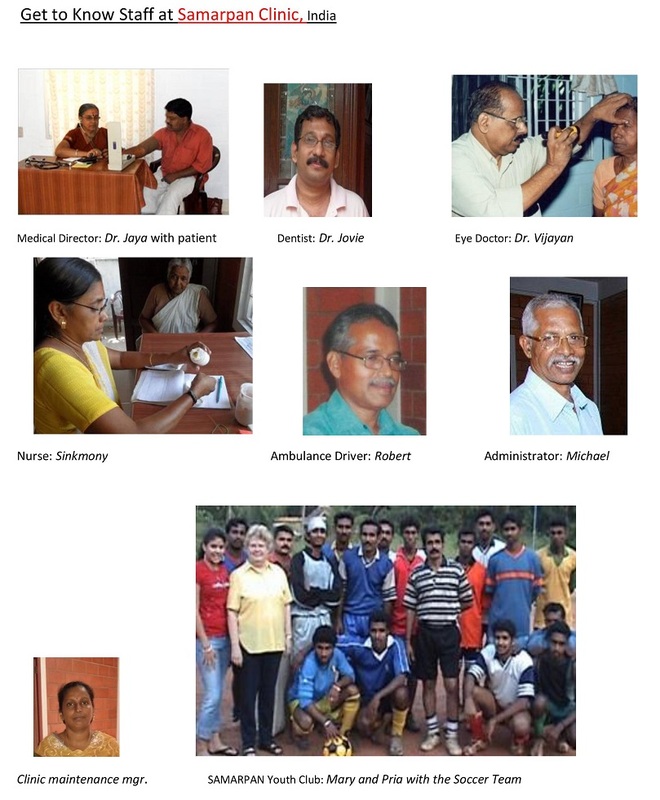 Some of the doctors and nurses from the USA have volunteered their services at the Samarpan Clinic. 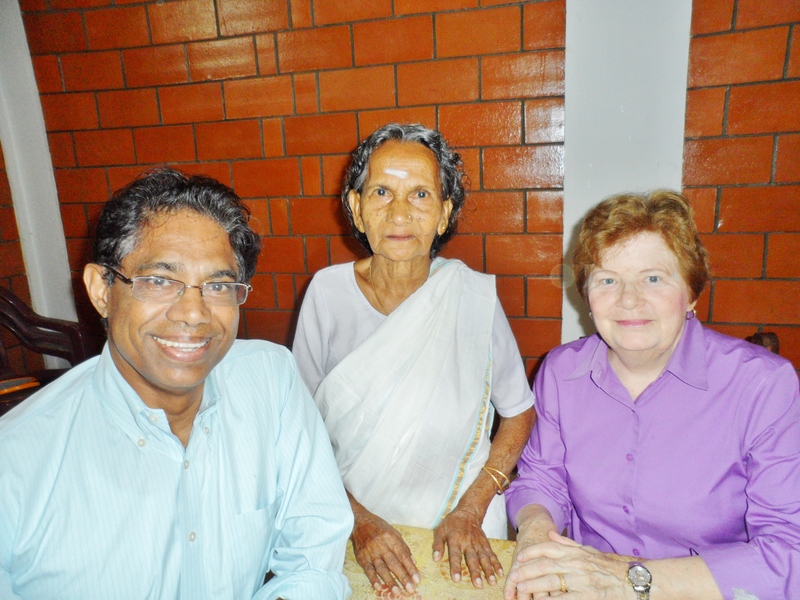 They traveled to India paying all travelling expenses by themselves in order to serve. We see that the needs are great but we can only undertake services that we can effectively manage. This forth coming mission will focus on advancing “Meals on Heel’s”, diabetic care, blood pressure treatments, eye care, and dental care. We will meet with all Samarpan’s doctors, nurses, and other clinic staff. We are also aware that the meals program has become a much needed service in the village. The beneficiaries are either disabled or family members have abandoned them or they are left without any income. Please continue to pray and support Samarpan so that our trip is successful and safe. Samarpan’s web-site is refurbished and now it has a modern look. Please check the site as many times as possible and refer to friends. Paul Gordon did a fantastic job rebuilding the web page and maintaining the site. Thank you, Paul. www.UncondionalService.com We will be back from India by Thanksgiving. Upon returning from work in Puerto Rico during the last two weeks of July, I had to hustle and do my laundry, pay bills, and repack. Two days later I would leave on an adventure I had only dreamed about for years: A trip to India – my destination, Kochi (Cochin in English), in the southern state of Kerala, traveling via Taipei and Singapore. The reason: Samarpan (www.unconditionalservice.com) medical clinic, located in Kottapuram and operated by Dr. Alex Kodiath (EdD), is desiring to add a dental clinic for children in one of the examining rooms. The two story structure was constructed in 2003, on the site where his father had lived and died (1987), and where the medical clinic began (1989) after he passed away. Patients are seen every day in the medical clinic on the first floor of the Samarpan building, with a full time nurse and pharmacy. Various specialists (family, ophthalmology, OB-GYN, Peds) rotate thru on certain days each month. It was now time to add dental services for young patients (up to 18) and SDCDS referred Dr. Kodiath’s request for help and consultation, to me. It was definitely an honor to assist, and be assisting, with this project. When I arrived at Kochi, Dr. Kodiath and son, Praem, were already there. I was driven from the airport to Kottapuram, a village of about 35,000 people, about an hour north. I quickly got situated in my private room, upstairs where lovely living quarters with private bath, are located, and went to sleep. My system and body did not like the idea of the 12 hour change: When I arrived at 10 pm, it was 10 am in California (actually 9:30 am, as there are actually 10½ hours difference for some reason). When I awoke the next morning (night for my system), there was hot tea waiting for me on the table. Soon, a full breakfast arrived from the nearby house of a niece, and I enjoyed my first feast, all local foods and flavors. I always enjoyed Indian cuisine anyway, but this was a special treat! My favorite breakfast? “Thread Bread,” which looks like an off-white ball of yarn, over which is poured a spicy split pea with vegetable sauce. Yummmmmm… it makes me hungry to think about! Every day we enjoyed three full meals, all local cuisine, sitting with Dr. Kodiath and son at a large table. Eating is done with fingers instead of utensils, but I stuck to my fork. The cook and other family members seated in chairs other than at the table, and this I interpreted as a custom of courtesy and respect. We also enjoyed a walk every day, which I found rich in photo ops as we strolled. Dr. Kodiath grew up there, and everyone would greet him, often stopping him to chat. So I was treated like a king, and felt like one, too. The monetary denomination is the rupee, and the exchange rate is 40 rupees to $1 US. This had slipped from 50:1, due to dollar weakening. In spite of this, everything for sale (food, clothing,souvenirss) is based on local economy, and seemed “very reasonable” and inexpensively priced. To send a post card was a little more international, but cost only 8.00 rupees (20 cents US). My all leather Indian sandals were 250 rupees (just over $6 US). There are 16 different languages spoken in the country of India, Hindi being the most common. In Kerala, however, Malayalam (same backwards or forwards) is the common language, so common that most people would not understand Hindi. If one does not speak Malayalam, a translator is of course necessary, although most students in the high school speak some English. It was so much fun to see the immediate smiles on the faces of school children walking by, as we would say, “Hello,” or “Good Morning,” or “How are you?,” and they would try to answer in English, usually successfully. Of interest to me are the footprints which St. Thomas (Thomas, the disciple, the “doubter”), left in the territory surrounding Kottapuram. Thomas is said to have traveled to the west coast of India in his mission outreach to spread the gospel. There is a small stretch which must be traveled by land, when leaving Jerusalem. But the majority of the trip would have been by boat across the Arabian Sea, to the coast of India. He lived several years of his life here, preaching the gospel and teaching others about his first hand experience with the Master. Any statue one sees of him has a book in the left hand, and the index finger outstretched on his right hand, as if in a position when he felt the spear hole in Jesus’ side. His influence was widespread, and for this reason, there are many Christians in this southwestern part of India. The plans for the dental clinic were begun and are progressing. It is all being funded by donations to Samarpan. With the help of a local dentist nearby, Dr. Jovie Joseph (DDS), one of the chairs has been ordered, just about $2,000 US, light and handpiece console included. Not too bad! We feel that local manufacturing yields much better local servicing of equipment. We will begin seeing children as soon as the chair is installed and functional. We are maintaining a list of interested colleagues who could volunteer either a one or two week period, and this would begin in early 2008 when the patient load is sufficient. We already have a good number on the list. 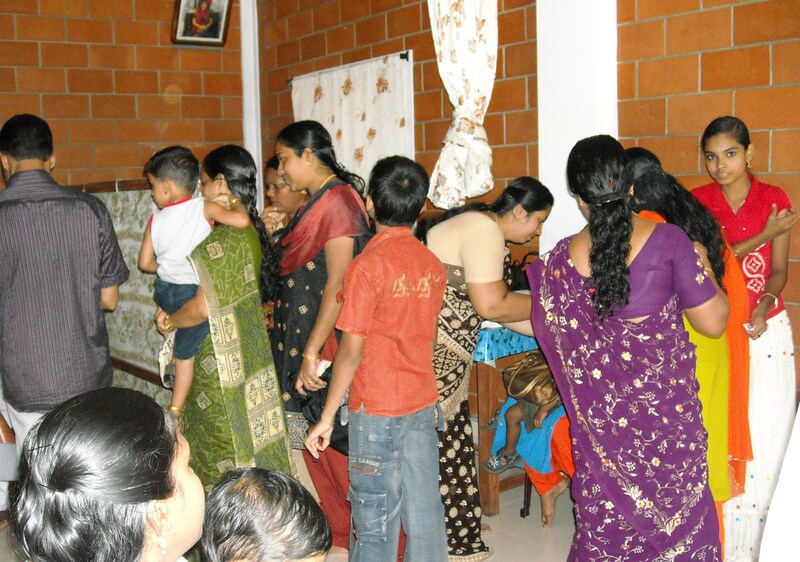 On Sunday, all children from one of the nearby orphanages were screened. Generally, nothing worse than what we encounter here, was seen. There is less availability of refined sugary snacks in their environment, so less damage is caused by between meal snacks. Education will be one big goal of this Samarpan dental clinic. From the reaction to our screening, with other similar organizations nearby asking for help, it appears the clinic will become very busy very soon. 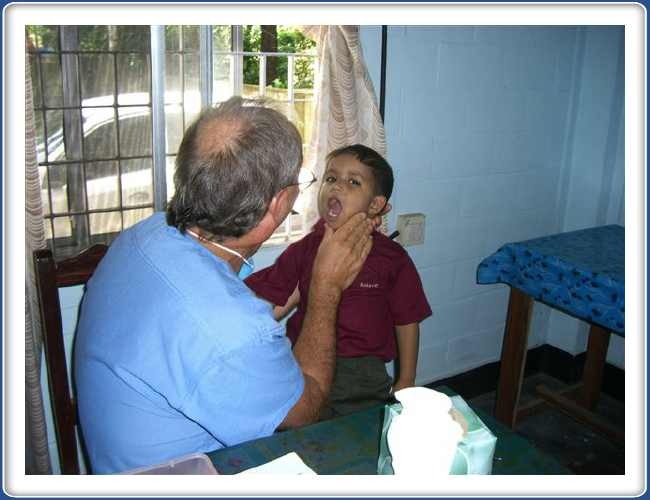 If you are interested in helping with the Samarpan project as a volunteer dentist, please contact Dr. Fritz. Believe me, you will be treated in a special way by special people, and you will not be disappointed. On the contrary, being privileged to help in a needy environment like this, brings many rewards and a satisfaction that money cannot buy. I appreciate any of you who can help. Click Here to see more pictures of my trip. “Ninety percent of the population faces long-term care for their life or the life of a loved one. 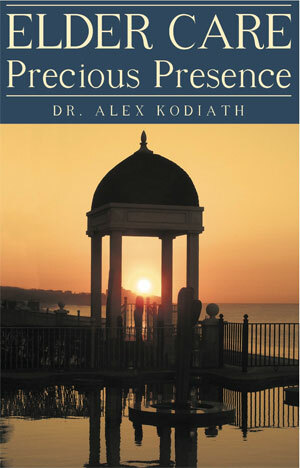 In Elder Care: Precious Presence, author Dr. Alex Kodiath presents personal, true stories of life in long-term care and reflects on the lessons that can be drawn from these stories. With almost twenty-five years of experience in social work in the medical field, Kodiath gives guidance on the spiritual nurturing of those in long- term care and discusses the importance of compassion in caregiving. Elder Care: Precious Presence provides the tools for professionals and families to understand the needs of the sick and the elderly and how to answer these basic needs with love and grace. The stories illustrate the concept of the spiritual grace of presence. 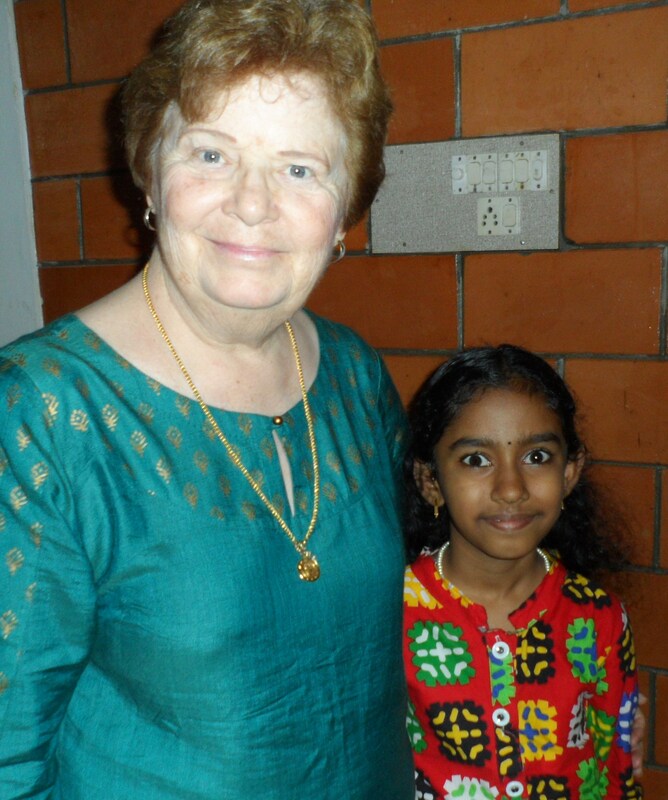 Mary and I returned last month from India after a successful humanitarian outreach program of Samarpan in India. Although the trip was tiresome, we felt a special sense of protection because we traveled almost to the other side of the world, 20 hours of a airplane ride, and made it through the crowded streets of India. There had to be a providential power guiding us. Without any struggles or hindrance we are back to our regular work with good health and spirit. We want to thank you very specially for your support and prayers for Samarpan’s projects. We guess that you would like to know more about the events and projects we addressed during this trip. 1. 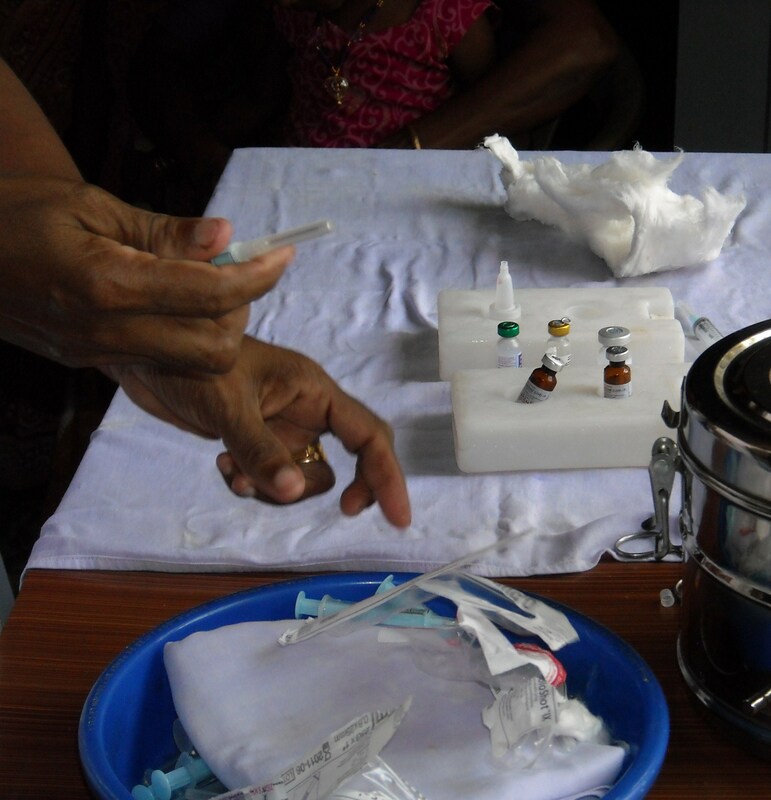 We planned three special medical clinics while we were in India. We met with three of Samarpan’s doctors and attended their clinics: the general medical clinic, eye clinic, and dental clinic. These clinics are going on with much care and support. 2. The new project was initiated because of the results of our informal study to start a meal program. The study showed the special needs for the vulnerable members of the community. 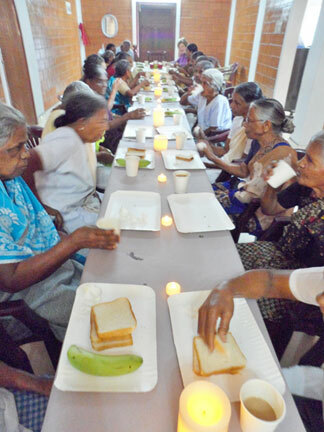 There are many elders in the locality who have no family support or any financial means to have food day by day. Some of the illnesses are due to lack of proper nutrition. We understood that these people not only need medical interventions but also nutritional assistance. 3. Though our staff cannot prepare meals we came up with a simple and at the same time highly nutritious meals without much labor, preparation, and refrigeration: boiled eggs, bread, and bananas. The official meal program was started on January 2, 2014. Both of us and our staff ate the same food with twenty eight people at the clinic. The people who could not come to the clinic had the meals delivered to their homes. These people are basically bed ridden. We will give these meals every Thursday and they will be able to stretch it to use for 3-4 days. It’s unbelievable. There were some of these people that took Mary’s hand and just cried with such gratitude. They have almost nothing to eat and no one to help them. 4. When our diocesan bishop heard about the meal program, he came to our clinic. He thanked us and said that he would like to add some more names to the list of people to be included in the meal program. 5. In front of the clinic there is a community who has to use a steep climb to reach to a common road. During night and rainy days people continue to fall as they climb this steep area. Children and elderly are more vulnerable. 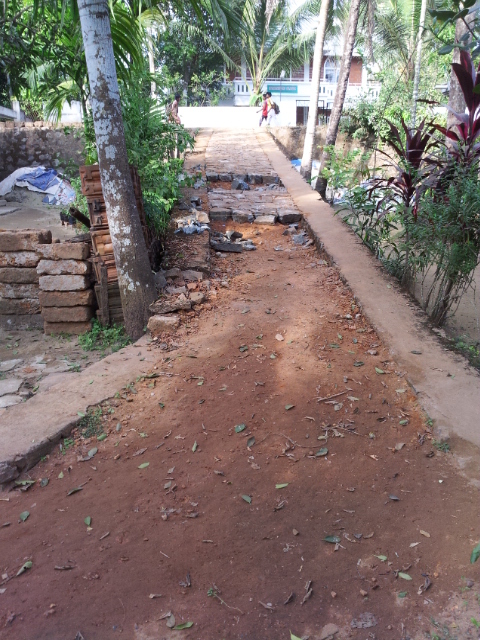 Therefore, we decided to fund the repair to this and make the climb secure and permanent for the community. Please find some enclosed pictures. Thank you again for your unconditional support to Samarpan and happy New Year. We are celebrating a special event. Alex has published his 3rd book! 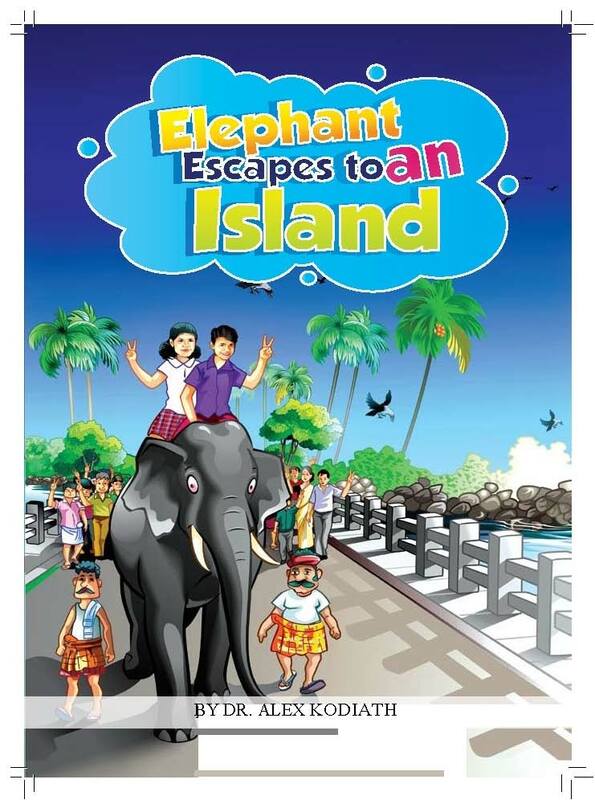 Friend and Family were invited to a book signing party on June 9, 2012 of his book, “Elephant Escapes to an Island.” Though it is a children’s book it is equally good for adults to read. Through a fun and factual story the author is making an effort to inspire readers into leadership, cooperation, and forgiveness through a simple Elephant story. Alex shared his forthcoming trip to India to start the Safe Drinking Water Project for children at the Samarpan Clinic. He has planned his summer vacation for this project. Besides adding books to the children’s library, he is also expected to enhance the medical, dental, and vision care at Samarpan Clinic. He is still hoping to send some dialysis machines, defibrillators, and cardio tech instruments to India. Friends and Family gathered for a Celebration of Joe Andrew’s life on Sunday, August 7, 2011 at the Samarpan Spiritual Leadership Center in Alpine, CA. 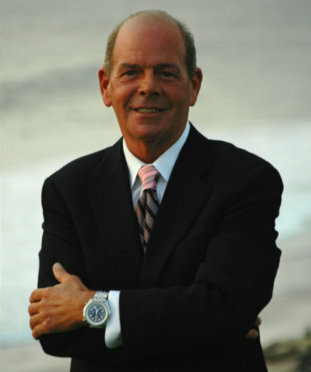 Joe served on the Steering Committee of Samarpan, a non-profit organization. In order for us to continue to provide "Samarpan" = "Unconditional Service" through our various programs in the USA and India, we welcome the generous support of individuals, businesses and charitable giving foundations who share our passion for helping others in need.